It is my pleasure to be among you and describe my experience in custody of Iran intelligence service in Tabriz as well as Tabriz Central Prison in order to help you to realize what the situation is like. 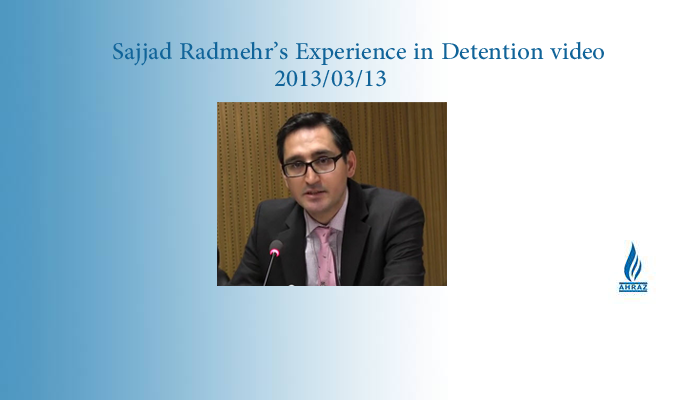 My name is Sajjad Radmehr, an Azerbaijani human rights activist from Iran. In 17 July 2008, I was arrested by Iran’s security forces and was taken to a solitary cell in Tabriz. I was there for exactly 98 days and then transferred to the Central prison of Tabriz where I was for 8 days. We were nine students who were active in the Azerbaijani Student Movement seeking cultural and civil rights for Azerbaijani people in Iran. During the detention period in the Iran intelligence service (which is called Ettellat) we just had a couple of short telephone conversations with our families just to say “I am OK and do not worry”. If one tried to say one thing more, the phone would cut off. The interrogation process was often with beatings. In the form that the interrogator who was sitting behind and my eyes were blindfolded with a cloth in such a way that I could just see the paper in front of me and he was hitting me with his fists and slapping in such a way that I sometimes fell down from the chair. In such circumstances, he often grabbed by my hair and hit my head against the wall asking the questions about for example my association with a foreign intelligence services. The duration of interrogation varied and was irregular, sometimes it continue for more than 20 hours and sometimes it was 15 days without questioning. I just paced around in the cell wishing to hear the torturer’s voice just for a change. I forgot to mention that the cell was a small room (2 by 1.5 meter) without a window and with an iron door. Another type of torture, which implemented by guards not by interrogator, was the so-called “Qapani” handcuff, in which the hands were pulled back to the back, one hand from down and another one from the top so that made the wrists come to touch each other. In this situation, they wanted me to stand only on one leg for hours and if my two legs touched the floor, they would beat me violently with batons. Once after a day with Qapani handcuff my thumb had become numb. I asked for permission to show it to a doctor but they took me to the toilet, showing a needle and threatened me to dig it into my hand if I asked about the doctor again. Swearing at my family and threatening to arrest my sisters were the most common way that the interrogators always used. While I normally had a shower every week there, one time they deprived me from that for a month and it was incredibly unbearable. After about 80 days in the cell, I had a serious mental problem, which I later understood was a case of schizophrenia. I sometimes heard that somebody was talking to me and it seemed that there was another person with me in the cell. It was so severe that when I later met the other friends in prison I told them I was becoming a prophet. After Ettelaat’s custody, I was with my friends in the Central Prison of Tabriz. Because there was no special section for political prisoners, so they had put them in the same ward with murderers and addicted convicts. Fortunately, I was kept in the ward, which was for financial criminals and although there were a lot of hygiene problems, shortage of bed and the deprivation of telephone calls, books and newspapers, at least it was more bearable than to be threatened or to be actually raped in the violent section. Now, after 4 years I still have recurring nightmares about the moments I experienced in the cell. My hands always tremble and I have to take medicine to adjust my heartbeat. This was my account of my personal experience in detention. However, I am aware that situation has become worse and worse since then.